SALE Starting at $2,499 More Finishes. Same Price. SALE Starting at $3,299 More Finishes. Same Price. SALE Starting at $3,899 More Finishes. Same Price. SALE Starting at $3,799 More Finishes. Same Price. Solid hand-planed hardwood and rich, natural finishes characterize our artisan line of Bassett rectangular dining tables. With each unique piece hand assembled and finished by one of Bassett’s artisan furniture craftsmen, every dining or accent table is built with extraordinary attention to detail. Our custom design program empowers you to put your creative hat on. Design a rectangular table that echoes your unique taste and aesthetic. With numerous options and finishes available, you can add your own flair and sensibility to the design of your new dining table and furniture. You might call it a return to form. 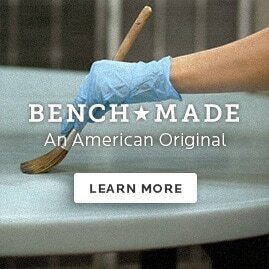 Bench*Made custom rectangular tables are crafted by our furniture makers the old fashion way – custom made from scratch. Handcrafted by one of our artisan craftsmen, hand planed, assembled and finished right here in America, it’s furniture building with a higher purpose. Your new table never touches an assembly line. Crafted with meticulous care, our furniture makers make every furniture piece one at a time to your order. Red leaf maple is sourced from the Appalachian region of the United States and resources are replenished as we plant two trees for every one we harvest. It’s honest. It’s real. It’s American-made furniture by Bassett. Go to a Bassett furniture showroom near you and have a look at our latest furniture creations. Become inspired by cutting edge design from around the world. Then, once you’re ready, let’s get together and build your next family heirloom.